We offer full service referral dermatology care for your pet. LVVD specializes in all skin, allergy, ear, hair and nail disorders. Allergy testing: Skin allergies are the most common cause of skin itchiness in pets. Dr. Palmeiro has advanced training in testing and managment of allergic skin disease in pets. The most reliable test for skin allergies in pets is an intradermal allergy test. Allergy test results are used to formulate an allergy vaccine (allergy immunotherapy) that is specific for your pet's allergies. At LVVD we have an in house allergy lab that makes allergy testing and formulating your pet's allergy vaccine convenient and accurate. Microscopy: Various skin samples may be taken during consultation with Dr. Palmeiro. These samples include skin cytology, skin scrapings, trichograms (a test that evaluates the hair) and ear cytology. Cytology of the skin is used to identify infection and cells that are indicative of autoimmune disorders or cancer. 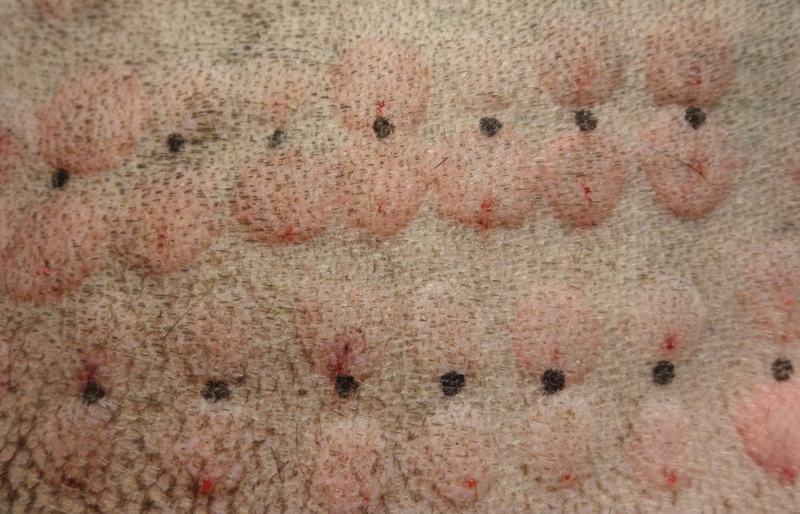 A slide is pressed to the skin, picking up samples of the cells and microorganisms present. 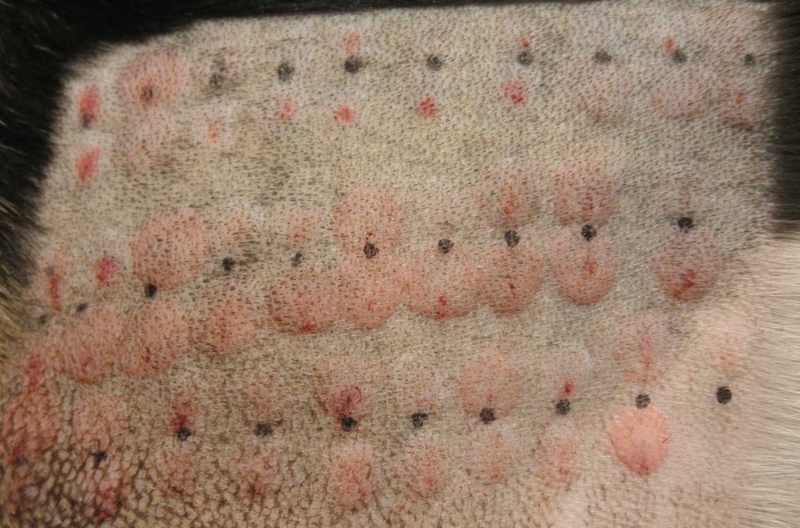 The microscope is used to evaluate the samples and determine the cause of your pet's skin problem. 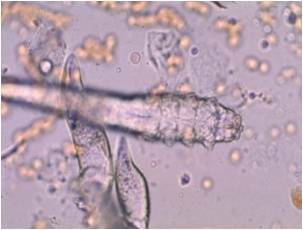 Below is an example of a skin scraping from a pet with a demodex (mite) infection. Skin culture: Resistant skin infections are becoming more common in our pets. The dermatologist can obtain skin cultures in order to determine the most approrpriate treatment for a resistant skin infection. Skin biopsies: Skin biopsies are a very useful test in the diagnosis of certain skin disorders. During a skin biopsy, the dermatologist will take small pieces of the skin that are processed into thin sections and examined under the microscope. Skin biopsies are particularly useful in the diagnosis of autoimmune skin disorders and various forms of skin cancer.